Immersion (IMMR) is the company behind haptic, or touch feedback, technology for some videogame consoles and cellphones. At D7, the company will reveal two of its newest technologies: TouchSense for touchscreen keyboards and Immersive Messaging. 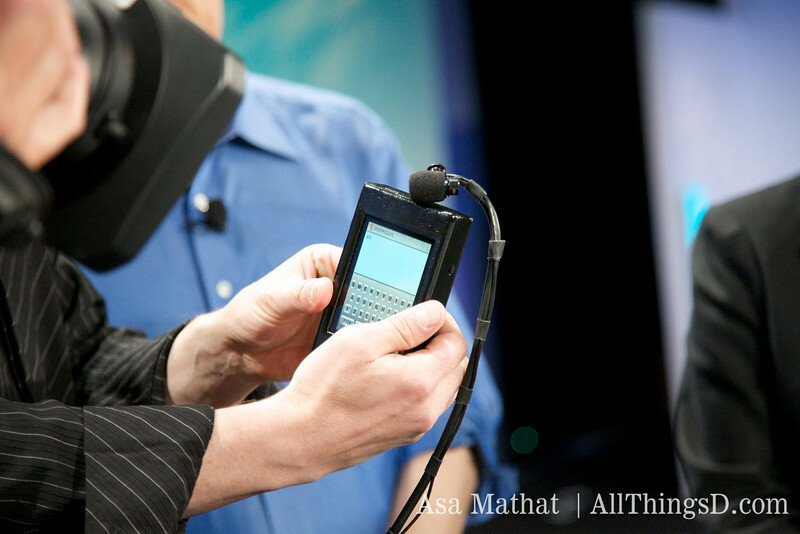 With TouchSense, the user is not only supposed to be able to get haptic feedback, but can also feel the virtual keys. Immersive Messaging will also use haptic feedback, as well as gesture recognition, to send messages that employ physical senses rather than text. Walt and Kara welcome Immersion CTO Christophe Ramstein to the stage. Rock music plays. Christophe: I am here to unveil two new things: Immersive Message and TouchSense Keyboards. Walt: So it makes an iPhone virtual keyboard feel like a mechanical keyboard. Christophe: Bingo. Everything here is new, shiny, and of course, available for productization. Cue infomercial: Ever feel like virtual typing is difficult? Now there’s TouchSense! Christophe types on the virtual keyboard and we hear the keyboard sounds. Pretty realistic. Kara tries it too. Christophe: What do you feel? Kara: Funny. I feel like it’s going to shock me. Walt: This is very cool, but what’s the advantage? Can I not look at my keyboard now. Christophe: It’s about transitioning between keys, and yes, without looking. Sounds alone don’t do the trick. We can do other things with our haptic feedback and kinesthetics too. Walt: Do Olli-Pekka and the Palm (PALM) guys know about this? Christophe: [says some stuff]. Walt: But you didn’t answer my question. Christophe: I understand that. [conference takes a beat, then moves on.] This was paraphrased, of course. Immersive Messaging: You can get physical sense-feedback through messaging. We also have “hapticons.” Hapti-huh? Kara: It sounds like what Kirk fought in the last Star Trek. Walt: Those were the Romulans.–Only at D7. I think it sounds like the Decepticon’s kid brother. Christophe demonstrates a hapticon heart on his phone. He now tells us to use our imaginations….Pretend you (Walt and Kara) are on a trip, and you are lovers. You can create a heart and it can even beat. Christophe blows onto his screen, and was able to send the heart over. He says, you can send these heart hapticons over the Internet. Kara: So it’s not like some creepy guy on the plane will send you one. Christophe: Touch the heart I sent you. What do you feel? Kara: It’s beating. Now Christophe’s using a hammering gesture, tapping on his phone. Walt feels these taps on the receiving end. Kara: He keeps nailing us. Walt: Not what I expected. The CTO starts to wax and wane: There are infinite possibilities. Walt: Actually there aren’t infinite possibilities in this limited-time demo. Now onto twiddling. It sounds a bit racy. Kara is intrigued (euphemism). Twiddling is that special time after I get off work, beer in hand, Christophe begins. Immersion may want to rethink that selling point. Twiddling turns out to be a way that two people can simultaneously touch their own phone’s touchscreens and virtually feel each other, again through haptic feedback. Christophe shows off the ability to say “cheers” to a friend with a champagne sound/feel of bubbles and clinking. Walt: Will this be an iPhone app? Christophe: I could tell you, but then I’d have to keeeeel you. Walt and Kara: Fair enough. Off with you now! You’ve been a good sport.